Raising 4 Princesses: Giveaway Winner! for contacting me about doing this giveaway. I'm having so much fun playing with it and creating. I love sharing cool stuff like this with my readers! Please send me your email soon so I can contact you and give you the details! My Memories Suite Digital Software Giveaway! to get a great deal on their software. on layouts that aren't included in your deal. On my calculator that's $20...wow! Feels good to save money doesn't it? All you have to do is simply use this coupon code STMMMS73421. This code is special just for Raising 4 Princess followers! and pass along my code I'd be so grateful. Hi this is stampgram here. Thank you so very much. I am so excited to win. 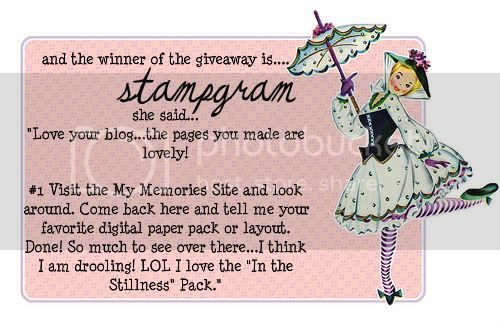 My email is stampgram(at)yahoo(dot)com. Thanks again for choosing me.